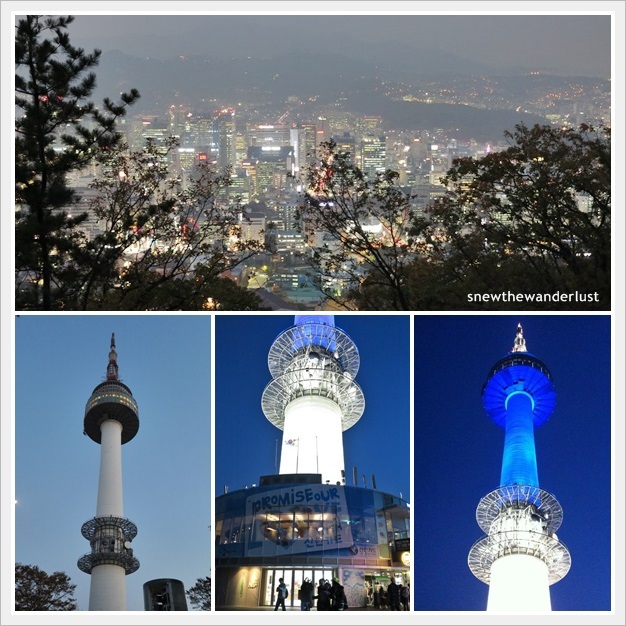 Namsan Tower, also known as N Seoul Tower, is one of the beautiful and romantic icon in Seoul City. I have planned to visit Namsan Tower in the evening. I imagined having the combination of the spectacular views of the city in the sunset. However, it didn't turn out very much as planned as the sun sets pretty fast during the Autumn season. When we reached the cable car station to Namsan Tower, the sky was already turning dark. There are two ways to get to Namsan Tower. The first way is by cable car, which offers you a good view of the city and the mountain. The second is by trekking the way up via a stone windy stairs. This would probably take about 30 minutes or more for me. Well, I wanted to save my energy as there are a lot of walking to be done in Seoul. Besides, the cable car ride would be an experience in itself. At the foot of N Seoul Tower, there are some few retail shops and restaurants. 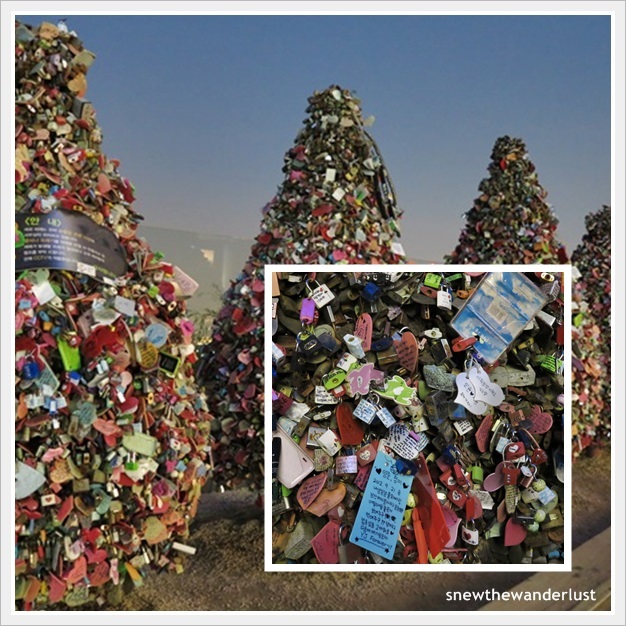 Besides the magnificent views Namsan Tower offers, the place is also renowned for its collection of "Locks of Love". Couples declare their everlasting love and symbolically does it by writing love notes on the lock and attaching over the "trees of locks" or the fences. The locks comes in all shapes and sizes, some very unique that are not commonly found. I wonder should the couple part, would they go back there to "unlock" the love locks? But well, who would bother doing it right? There are probably thousands or millions of locks all over and would be hidden beneath. A comparison of the towers around the world. It's a 360 degrees view of Seoul city. It was too dark for me to take a good shot of the view. So I will recommend going during the late afternoon where it is still bright to enjoy a clear view. If your love ones is not with you up the tower, you can post them a postcard and send it to your love one. Directions: Exit 3 of Myeongdong Station (Subway Line 4). Walk for 10-15minutes following the street uphill, on the right side of Pacific Hotel. (It might be a bit too complicated, so I suggest you just get a taxi from Myeongdong).